Winona's oldest restaurant since 1938. 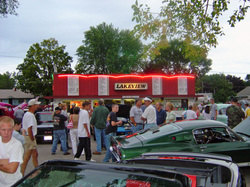 Lakeview Drive Inn was founded in 1938 and is an original family owned and operated drive inn (in) restaurant. We are not a chain, theme, or “fast food” restaurant per say, as our food is made to order and of a very high quality. We never cook anything in the microwave and never serve your food from a bin of pre made or warmer held items. Our employees are friendly hometown kids that want you to get the best meal and service they can provide. Lakeview’s Root Beer is made from scratch with our own exclusive recipe. We also make our homemade diet root beer with NutraSweet for those looking for a no sugar or diet variety. When eating at the inside counter, the outside picnic tables or in you car, we serve our root beer in old fashioned frosted mugs. We hold these heavy glass mugs in freezers at below zero temperatures to make your drink frosty cold. Our carhops have been waiting on (called curb service) the people of the Greater Winona Area since 1938 and Lakeview is proudly Winona’s Oldest Restaurant. Dining is an experience at the Lakeview Drive Inn and is like a step back in time. With a view of Sugarloaf, Lakeview Drive Inn is located on the Shore of Lake Winona and is a taste of days gone by. Lakeview carved its 100 year old Elm tree stump into a giant root beer barrel on Wed, Aug 17th, 2011. Award winning chainsaw artist Curtis Ingvoldstad did the project from start to finish in 1 day! Stop by to take a look or take a picture. It looks really nice in the evening lit up with our LED spotlight. (the installation of the light was donated by Matt Wardwell Electric). Click on the picture to see the progression of the carving on our Facebook page. This root beer barrel, carved by St. Paul artist Curtis Ingvoldstad, stands next to the parking lot at the Lakeview Drive-In on Sarnia St. It happens all the time. A favorite tree begins to fail, and needs to be removed. But it doesn’t always happen like this. Tim and John Glowczewski, owners of the Lakeview Drive-In, had a 100-year-old elm bordering the parking lot of their drive-in restaurant on Sarnia Street in Winona. As it began to die off, they watched it and an idea came to them. If the stump of the tree was good, why not use it as an icon for the old restaurant in Winona? So when the tree service came to take down the tree, the Glowczewskis had them leave a tall stump that would eventually become a huge root beer barrel advertising their tasty root beer. But the Glowczewskis didn’t just call up a buddy with a chainsaw. They hired well-known St. Paul wood carver and professional chainsaw artist Curtis Ingvoldstad. Ingvoldstad also teaches carving and is a frequent winner in wood carving competitions. Glowczewskis sent him a photo and a description of what they imagined the root beer barrel would look like. First Ingvoldstad spent a day — August 16 of this year — debarking and cleaning the stump. The next day, August 17, he appeared at noon and by 9 p.m. had completed the sculpture. “He worked like an animal!” Tim Glowczewski said. A new icon for an old restaurant was born. Many generations of Winonans and area folks have fond memories of the seventy-four-year-old drive-in, either as cooks, car hops, or customers — and many romances have begun there, too. The Lakeview began life in 1938. 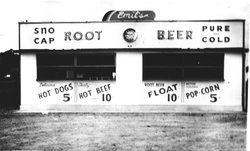 Emil Berzinski operated the root beer stand from then until 1955, when he sold it to Elmer Tarras. Tarras had the drive-in until 1977, when he sold it to the Glowczewski brothers’ father, Bill. The brothers bought it from Bill in 1993, and have run it since then. Lakeview is famous not only for the food, which in addition to root beer features burgers — the Toddy Burger, the Sugarloaf Mountain Burger, the Mt. Everest Burger being specialties of the house — but other menu items including pork sandwiches, brats, hot dogs, other sandwiches, and shrimp and chicken baskets. In a nod to healthy eating, they also have Elk Burgers, Turkey Burgers and a Vegetable Burger. And of course you can’t have a drive-in without a kids menu or a kids play area out back. The drive-in is also the place to be on Cruise Night, when all the vintage car nuts…er, aficionados…bring their cherry autos to the drive-in to be seen and admired. It’s worth the trip! Take a look at the root beer barrel, conveniently lit at night. It will stand there for many years, as will the drive-in. But if you want to eat when you visit, be mindful that the last day of their season is September 18 this year. Lakeview Drive Inn was built in 1938 by Emil Berzinski and was called Emils. In 1940 a large front was added to the small building. The building was fully enclosed in 1953.